Solving a mystery usually involves understanding connections between players. Computers and network visualization tools take us well beyond pushpins and string, but even they have a limit. 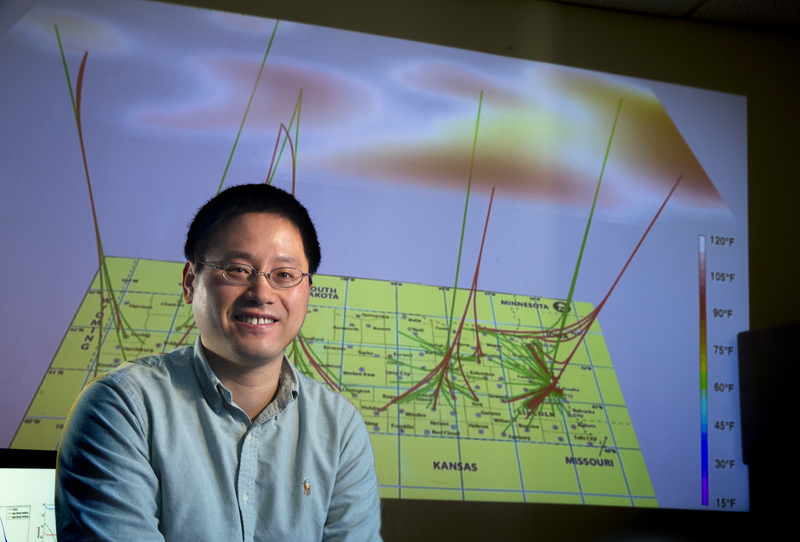 A Nebraska computer scientist is developing new techniques to greatly expand network visualization capabilities that ultimately could help crack complex scientific puzzles. Hongfeng Yu, assistant professor of computer science and engineering, recently earned a five-year, $476,952 Faculty Early Career Development Program award from the National Science Foundation to create software tools that will allow users to visualize and explore billions, even trillions, of interconnected entities. Network visualization helps uncover patterns. Expanding that capability would have wide-ranging scientific and industrial applications, from better understanding gene regulation networks and biochemical pathways to improving supercomputing speeds and investigating large social networks. These advancements could lead to better disease treatments, climate change mitigation and improved disease-spread tracking, among many other applications. Network, or graph, visualization can be as simple as a family tree or as complex as a map illustrating various connections among the world's nearly 2 billion Facebook users. The problem is that as the number of entities increases, each disappears as an individual into a solid mass. Most computer monitors max out at only about 8 million pixels, far fewer than many big data investigations require, Yu said. "No systems are available for the very large graph yet," he said. "We need to design a new visualization method to allow us to display such large graphs with a limited numbers of pixels." Additional challenges include the ability to interact with very large datasets, such as zooming in on aspects for greater analysis, as well as handling perhaps thousands of users at a time. Yu and his team are developing techniques and algorithms to identify, extract and organize information, or subgraphs, from within densely interconnected large graphs. Preprocessing information will allow users greater manipulation and visualization options. They're also developing techniques to guide users in exploring the graph efficiently and effectively. To conduct the research, the team will use Nebraska's Holland Computing Center, NSF supercomputing facilities and a test computing system the researchers themselves will build. Yu is collaborating with Zhenghong Tang, associate professor in the College of Architecture's community and regional planning program and in the School of Natural Resources; Chi Zhang, associate professor in the School of Biological Sciences; and colleagues at the University of Iowa. The award also allows Yu to improve science and engineering education by developing undergraduate and graduate coursework related to large graph visualization.